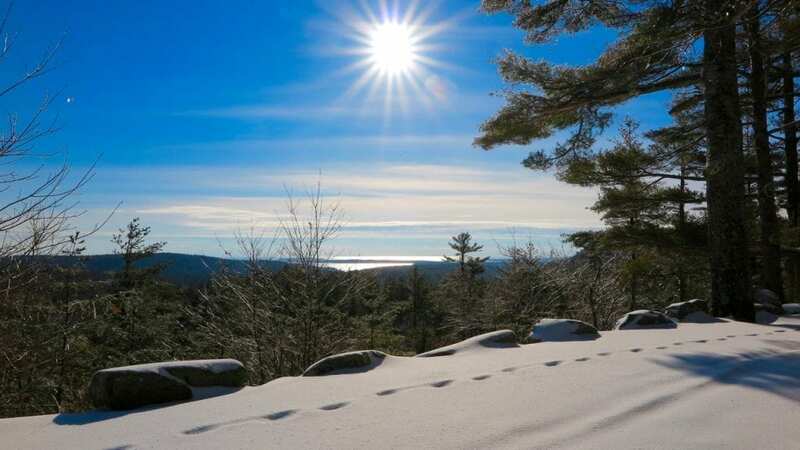 Winter on Mount Desert Island does not have to mean less exercise or less time outdoors. In fact, for many it can be just the opposite! 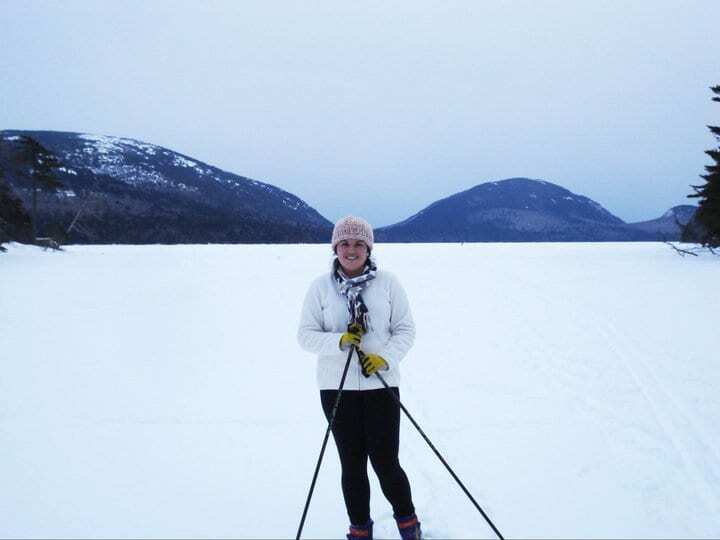 One of the best outdoor winter activities MDI has to offer is cross-country skiing. If you’ve been wondering ‘Where can I go?’ this post is for you! The favorite place of islanders to cross-country ski is the carriage roads. This is not only because these wide roads through the woods are a natural fit for cross country skiing, it is also because they are groomed. 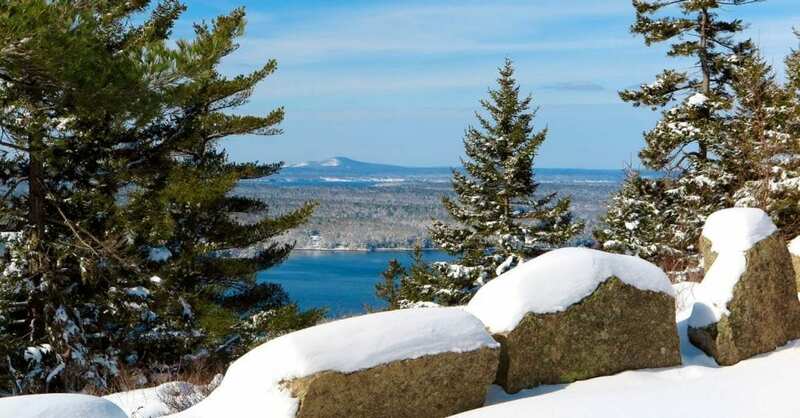 Of the 45 miles of carriage roads, up to 32 (depending on the conditions and resources) are maintained by the Friends of Acadia Winter Trail Association. When there is over four inches of snow, they often break the trails down into six distinct paths. They ask that you follow these paths. Where On The Carriage Roads Should I Go? We have identified what we consider to be some of the better carriage road trails here and organized them from Easy to Difficult. The general consensus among cross-country skiers is that there are not really any truly difficult or arduous paths on the carriage roads. We agree. But we felt it would be helpful to provide various levels of difficulty to help skiers choose the path for them. Just remember to consider the context: the carriages roads collectively (versus everywhere you have ever cross country skied). Easy: If you are looking for a popular path that is on the relatively easier side, Witch Hole Pond Loop is a good choice. It is near Bar Harbor and quite popular. It is mostly flat, with really only one steep hill. This is good for beginners or anyone who does not want to push themselves too hard. This path can be extended by going on the offshoot loop, Paradise Hill, which is only about one mile and is of a similar ease to Witch Hole Pond Loop. Mild: The upper section of the Hadlock Loop is a path that could be classified as somewhere between easy and moderate. It is not much more difficult than Witch Hole Pond, but it is not quite as flat and so it will take a little more energy. You enjoy great views along the way and go beside a portion of Upper Hadlock Pond, for a small–but very pleasant–part of the journey. Moderate: Jordan Pond Connector connects the Aunt Betty Loop to the Amphitheater Loop. It is a longer route and is not a loop itself, so you have to go round trip or plan a pickup on the other end. You are rewarded with great views of Jordan Pond along the way. A Little Difficult: While the Aunt Betty Loop is not that difficult on a whole, it does feature one of the steepest hills on the carriage roads. The part we are speaking about is from Aunt Betty’s Pond to 7 Bridges. But it is worth it! A Little More Difficult: Amphitheater Loop. This path consists of many twists and turns and is one of the last paths to be groomed. As such, it can be more rigorous than other carriage road paths. You can connect to the Hadlock Loop or the Jordan Pond Connector via the Amphitheater Loop. Difficult: The Cedar Swamp section of Upper Around Mountain. This is also one of the later sections to be groomed, but there have often been enough skiers come through that you can follow their path. At times you get some great views of Somes Sound. You can consistently enjoy a quiet ski amidst the classic scenery of snow-covered trees. This path may be difficult, but it is certainly worth it. Look at these views! These photographs were taken by Hope Rowan from the Upper Around Mountain Path. Though the Carriage Roads are the only place on MDI that is groomed, they are not the only place that people go cross-country skiing. Here are some other non-Carriage Road options. Park Loop Road. The 27-mile Park Loop Road is the main artery running through Acadia National Park. It is usually closed to car traffic from December 1st through April 15th (though this time could be extended on either end because of weather). But it is open to cross-country skiers and snowmobilers, whom you need to be aware of. As there are many sections of the Park Loop Road, the rigor of your experience depends largely upon what section you choose. However, there are generally many ups and downs throughout as not many sections of the Park Loop Road are level. Seal Cove Road. It is on the “quietside” of the island and is especially quiet in the winter. It goes through the west side of Acadia National Park and is closed during the winter. As such, you pretty much have the road to yourself if you are a cross-country skier. There may be the occasional snowmobiler to be on the lookout for, but they actually help make Seal Cove Road better for cross-country skiers as they provide a bit of grooming to an otherwise ungroomed road. Frozen Ponds. It seems like islanders do almost anything on frozen ponds–ice fish, hockey, ice skate, or cross-country ski. There are a variety of different ponds on the island with various levels of grooming. The most important thing, of course, is safety. It is not recommended to ski on ponds outside of ice fishing season (January through March), as the ice may not be thick enough in other months. If you have any doubt about the thickness of the ice or safety of a certain pond, do not ski there. Use caution! The best place to get gear is Cadillac Mountain Sports right in Bar Harbor. You can rent skis or buy new ones and pick up any needed accessories like gloves or wax. They have some of their old rentals for sale at their Ellsworth location, but you don’t necessarily have to go to Ellsworth to get them. If you are interested in buying a rental from the Ellsworth location they may be able to transfer it down to you. Note: there is also usually a big sale at their Bar Harbor location in March so be on the lookout. Also check out the local Facebook groups (Ex: Bar Harbor Barter and Swap) for people selling their gear… or post that you are looking for used gear to entice people to look through their attics and garages on your behalf. We hope this posts gets you excited to get out there and ski!